The Toronto Marlies finished the AHL season with a league-best 112 points and they capped off their incredible season with their first Calder Cup title in franchise history on Thursday night. After crushing the Texas Stars 6-1 in Game 7 on home ice, the Marlies spent the rest of the night after the game partying at Real Sports Bar & Grill. As you can probably guess they were the life of the party as they took over the entire restaurant from serving behind the bar to dancing on top of it. 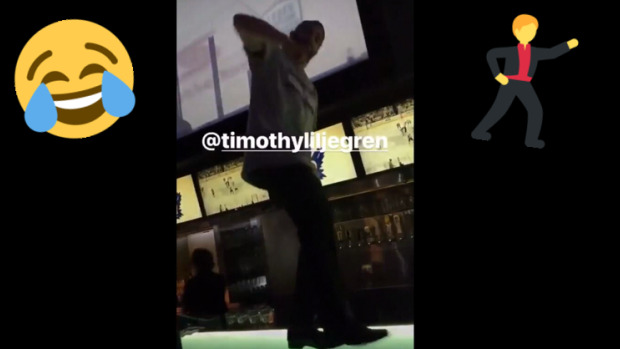 Every member on the team partied the way they should after capturing the league title, but one player who really stood out the entire time was defenceman Timothy Liljegren, who turned the bar into his personal dance floor. Hockey fans in Toronto will have a chance to congratulate the team and celebrate with them one more time at a special event at Ricoh Coliseum on Saturday afternoon. If you’re lucky, you’ll see some more of their sweet dance moves on display.